Bienen Prof. Victor Yampolsky conducts the Northwestern University Symphony Orchestra in preparation for its April 23 performance in Pick-Staiger Concert Hall. Yampolsky has been the director of orchestras since 1984. 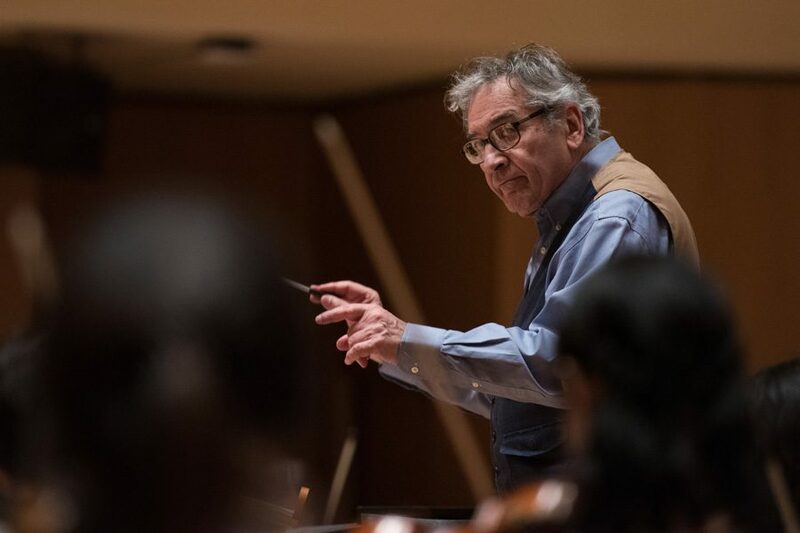 More than three decades after accepting his job as Northwestern’s director of orchestras, Bienen Prof. Victor Yampolsky will lead his musicians in a performance this weekend that is a tribute to his teenage years. Bienen students in the Northwestern University Symphony Orchestra will play Dmitri Shostakovich’s “Symphony No. 10 in E minor,” a piece Yampolsky said was part of his musical upbringing in Moscow. Growing up in the USSR, Yampolsky said he had several opportunities to see Shostakovich in live performances. Those memories bring out the best of his conducting abilities, he said. Yampolsky said his first memories from childhood do not come in images, but in sounds. Because his parents were both musicians, Yampolsky said he knew early on that he would be involved with music. He said as a kid he thought all children were raised with three fundamental concepts: letters to read, numbers to count and notes to be able to sing and play. Bienen graduate student Daniel Brottman, a horn player who has worked with Yampolsky several times at NU, said Yampolsky exhibits a personal connection with the music he teaches his students. “He’s a profoundly musical person, who has a really matured, nuanced and deep understanding of the music,” Brottman said. Yampolsky said to be an orchestra member, a student does not need to be of a high technical caliber as long as they have passion and a profound love for music. He said he also looks for a collaborative spirit in his orchestra members. Since his arrival at NU in 1984, Yampolsky has created the Northwestern University Chamber Orchestra and the Philharmonia, the latter of which is open to non-music majors. Bienen Dean Toni-Marie Montgomery said the orchestra students sound like professional musicians. Montgomery attributed their skills to the training they get from Bienen faculty and Yampolsky, who has the ability to combine instruction of different instruments into a cohesive whole. Despite the challenging music and dealing with his musicians’ busy schedules, Yampolsky manages to pull out the best of them in each performance, Montgomery added. “We continue to benefit every year from the training that he provides to our students,” she said. What inspires Yampolsky to select the classical pieces is the way the music has integrated into modern aspects of our daily lives, he said. Classical music has come a long way since he was a child in Russia, he said, and people are able to understand classical pieces through a contemporary lens. Throughout his tenure at NU, Yampolsky said he has always felt in the right place at the right time. Yampolsky added that he foresees himself staying at NU for many years to come, because there will never cease to be music he needs to hear and students he needs to teach. The orchestra will have one performance of “Symphony No. 10 in E Minor” on Saturday at 7:30 p.m. at Pick-Staiger Concert Hall.